Viktor Ivanovich Borodachev was born on 23 August 1918 in the village of Shirokii in the Stalingrad area. In 1936 he finished a pedagogical school in Moscow before joining the army. He completed pilot training at the Military Air Collage in Orenburg during 1938. Borodachev took part in the Finnish-Soviet Winter War. He served with the 131 IAP through out the Second World War. He wasn’t committed to combat in the Great Pacific War until 1 February 1942. On 4 May 1942 he claimed his first victory when eight Bf 109s attacked his flight in the Semi Kolodeze area. He managed to shot one of the German fighters after a half-hour long combat and the whole flight returned home without losses. At this time he was flying Polikarpov I-153s. On 8 February 1943 the 131 IAP was renamed to the 40 GIAP. On 1 July 1943 he led six La-5s to bounce a large formation of Ju 87s escorted by Bf 109s in the vicinity of Kochetovka (north east of Lipetsk) and personally accounted for one of the six Ju 87s that were shot down. On 5 July 1943, while flying a La-5 he claimed a Ju 87 and two Bf 109s in one sortie. On 17 October 1943, again flying a La-5, he claimed a Ju 88 and two Fw190s in three sorties. At the end of the war he was Kapitan and Komesk (commanding officer of an eskadrilya) in the 40 GIAP. During the war he took part in the heavy air battles above Tiraspol, Dnyepropetrovsk, Taganrog and Kursk-Orel. He also served with the unit on the 1st Ukrainian Front. 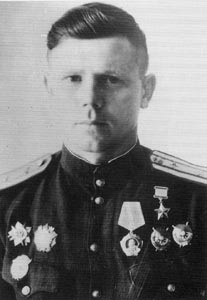 On 1 July 1944 he was decorated with the Gold Star of the Hero of the Soviet Union for 364 sorties 19 and 5 shared victories claimed during 91 air combats as of February 1944. During the war he was also decorated with the Order of Lenin, the Order of the Red Banner (for times), Order of Alexandr Nievskii, the Order of the Patriotic War 1st Class (twice) and the Order of the Red Star (twice). Borodachev ended the war with 1 biplane victory and a total of 26 claimed during 552 sorties and 116 air combats. His claims included He 111, three Ju 88s, Fw189, eight Ju 87, seven Bf 109s and 6 Fw190s. During the war he flew the I-153, LaGG-3, La-5 (in which he claimed most of his victories) and La-7. Borodachev continued to serve after the war and graduated from the Army Air Academy in 1950. In 1960 he graduated from the General Staff Academy. Borodachev was killed in an accident on 11 July 1968. TOTAL: 26 and 5 shared destroyed.